Park(ing) Day NYC, as part of a larger international movement, supports the conversion of parking spots into people-friendly public spaces for the day. Park(ing) Day engages citizens, artists, and activists to create discussion around how public space is being allocated and to allow people to reclaim a piece of the city temporarily. I headed out to Flatbush at 7:00 am to await the arrival of the sod that would transform the black pavement into a large rectangle of space soft enough for babies to stretch their little limbs. And stretch—and paint and cry and drum—they did. The site was located in front of the public library, across the street from a public playground, and within a block from the local elementary and middle schools. Needless to say, kids were the main participatory constituency. We had a thoroughly entertaining puppeteer, Ronny Wasserstrom of Playdate Puppets, with us throughout the day, delighting babies and accompanying parents alike. Stephanie Huffaker from Garbage of Eden Design was working all day with children, up-cycling costumes made from newspaper and markers. Louise Bruce from Compost for Brooklyn, a new community composting site and native plant garden on Newkirk Avenue, was providing information on composting and took all our cardboard waste with her at the end of the day. 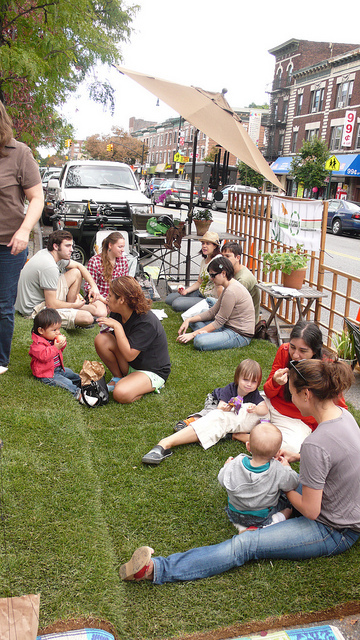 The grass drew in most of the crowd, as people were invited to stay and snack on donated treats from the Flatbush Food Co-op and relax in the sunshine. Sustainable Flatbush Energy Solutions Director Jocelyn Cohen gave demonstrations on solar-powered generators. To close out the day’s programming, Richie Barshay provided us with some beats and melodies as the sun began to lower. I had never heard of Park(ing) Day before participating in this event. As I talked with people who dropped in because they were curious about the crowd or the fact that people were literally laying in the street (protected by a lattice and a cone perimeter! ), I realized that the intent behind Park(ing) Day was not necessarily obvious. We were situated directly in front of the public library which has a “public plaza” taking up much of the corner of Argyle and Cortelyou roads. Without any kind of seating or inviting elements, the plaza is unfortunately a barren, under-utilized potential source of public space that is sorely needed in the Flatbush community. Throughout the day, I interviewed students, parents, nannies, and community members about their thoughts on public space usage in the city. The results were resounding: more people-friendly space, with green if possible, is very much wanted and needed in the city. Their responses will be compiled in a short video documenting Sustainable Flatbush Park(ing) Day 2010, so check back for that post. As we rolled up the last of the sod, packed up the bikes, and swept the street, the parking spot gradually returned to an empty space with no visual remnants of the community engagement that had transpired. A unique event in the environmental/social justice movement, Park(ing) Day was not a fundraiser, nor a protest, but simply a fleeting reminder of the need for community interaction in a public setting. As Sustainable Flatbush continues to work on the Livable Streets Initiative, we will be thinking about how we can improve access to people-friendly streets to everyone. What a great idea: people-friendly streets for everyone. we live in a world with too much business and a great anonymity. The most people do not take care of someone – or are caring about of others’ feelings. Children do not have a lobby as well as disabled and very old persons. They could come together in people-friendly streets and they could learn from each other!! 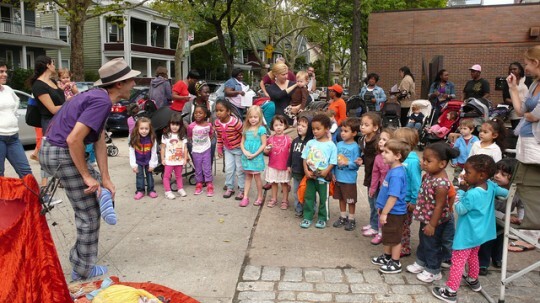 Cortelyou Farmers’ Market is open! Check out the photos from our Spring Celebration! Slow Food potlucks in Flatbush this weekend!